We love the idea of the Glowing Plant Project, which will teach you about synthetic biology by allowing you to do some. The group has a Kickstarter campaign that, if successful, will allow anybody to grow a glowing plant from jellyfish DNA and a mustard flower. What's amazing is all the technology that already exists to do this. We have "gene printers" that can literally print out DNA, and a "gene gun" to shoot modified DNA right into the cells of the plant. The result? A mustard plant that glows green, just like a jellyfish. The jellyfish's green fluorescent proteins are used all the time in genomics, and are harmless. There have already been genetically engineered glowing green bunnies, kittens, and more. What can this glow-in-the-dark kitten teach scientists about AIDS? The group hopes that this project will lead to DiY synbio kits, and will help everybody from kids to scientists learn more about one of the most important new fields in biology. By backing this project you can help create the world’s first naturally glowing plant, inspire others to become interested in synthetic biology and receive some awesome rewards in the process. Transforming the plant will initially be done using the Agrobacterium method. 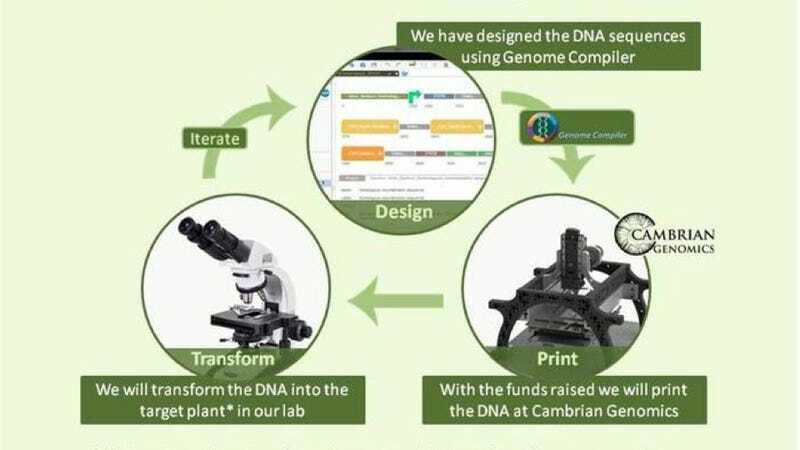 Our printed DNA will be inserted into a special type of bacteria which can insert its DNA into the plant. Seeds of a flowering plant are then dipped into a solution containing the transformed bacteria. The bacteria then injects our DNA into the cell nucleus of the seeds which we can grow until they glow! You can see this process in action in our video.